“Nathaniel Adam cursed his luck at being hurled across dimensions again, only to bump into a large green man who decided to start hammering him into the ground, matters got worse when a hammer wielding buffoon joined in. The pair were incredibly strong, but not the brightest of fighters, and with barely any provocation on his part they handily started fighting each other. This gave Nathaniel his chance to leave, which might allow him to try and find his bearings. “Carol Danvers moved promptly when the news of the Hulk was engaged in a brawl with, according to reports, the Silver Surfer. The Surfers presence on Earth always meant something was up, and when it was then reported that Thor had entered the fray she couldn’t help but sigh. “As she approached the area she noted that the energy she was sensing didn’t correspond to the ‘power cosmic’ of the Surfer. 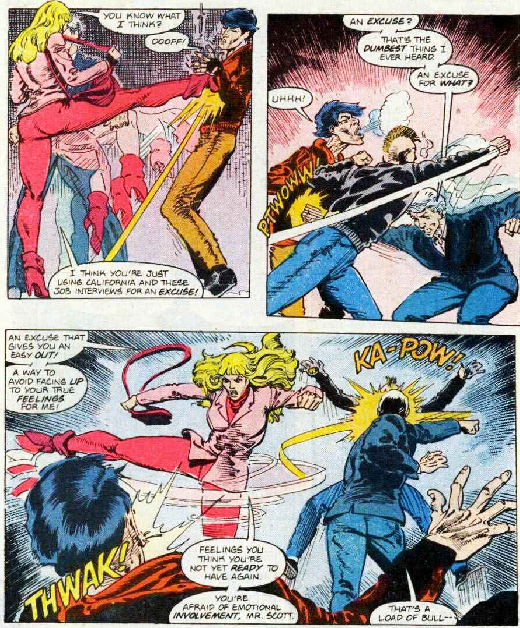 The energy was unique to her senses, and it was moving away from the inevitable brawl between Thor and the Hulk that was now occurring thankfully away from anywhere populated. 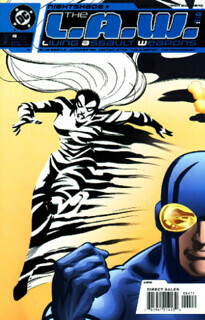 Leaving Thor and Hulk to their own devices she moved to intercept the mystery individual, to see a silver skinned man bearing a chest symbol not dissimilar to her own. 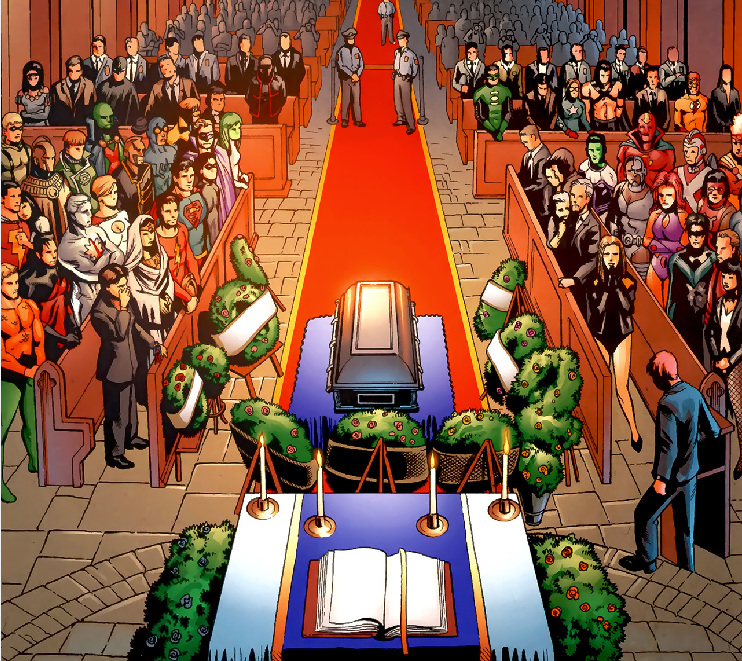 Could the man be a member of the Kree? 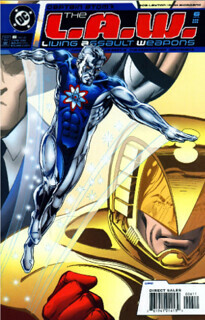 You can find Adamantis on deviantart.com, where he’s posted a lot more Captain Atom images among other beautiful pieces. Well, it is just like the old Charlton days in this issue. 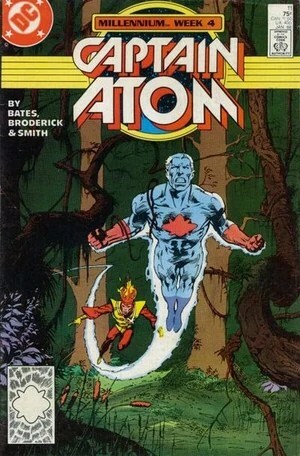 Captain Atom teams up with Nightshade to fight the Ghost. This issue, cover dated April, 1988, was gracing the shelves of comic shops on January 5, 1988. In continuity, it has only been five days since Eve Eden and Cameron Scott met at Smitty’s Bar. In his DC apartment, Nate receives a video message from President Reagan (delivered by two Secret Servicemen). 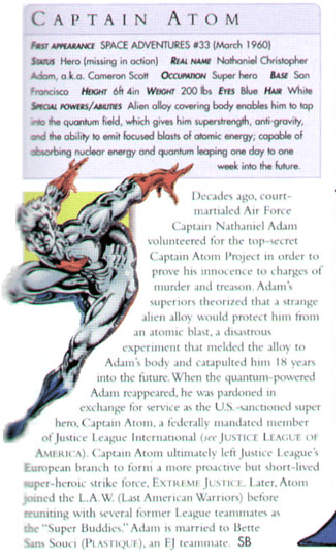 Reagan says he’s disappointed that Adam has severed his ties with the military “so soon after the first anniversary of [his] arrival from the quantum field.” Reagan says he’s leaving Adam’s “re-recruitment” in Eiling’s hands, but he personally asks that Captain Atom continue spying on the Justice League. Eve enters Adam’s apartment as the two Secret Servicemen leave. She knows who they are and why they were there. Meanwhile, back at the Base, Eiling is briefing his men on Eve Eden’s mission to spy on Cameron Scott (a fact she has not kept from Scott/Adam). 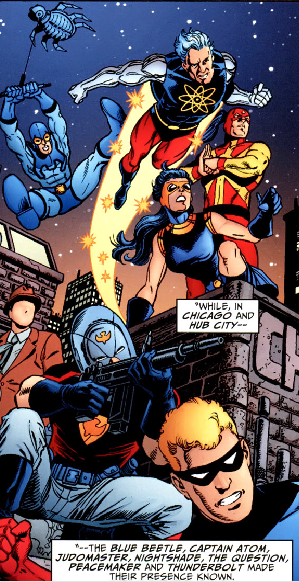 Eve Eden (aka Nightshade) is on loan to Eiling from Amanda Waller’s Suicide Squad. Back in DC, Nate tells Eve he has to go to California to check out some job prospects. They begin to have an argument (he was supposed to spend the remainder of the holidays with her) when they are approached by some street toughs. The thugs, armed with knives, make clear their intentions to take Nate and Eve’s money. 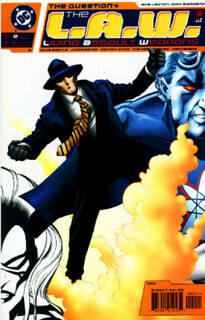 The two super hero/secret agents continue to argue as they beat the hell out of their would-be assailants. The fight ends with the thugs unconscious and Eve and Nate going their separate ways angrily. The whole altercation took seconds, and neither of them used super powers. Peggy and Goz see Nate off at the airport for his California trip. Of course, the use of the airport is just a pretense for Peggy and Goz. 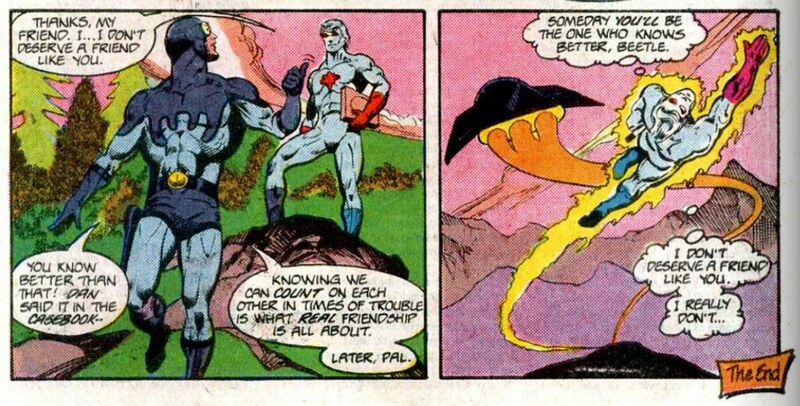 After parting with them, Nate changes to Captain Atom and flies west, still fuming over Eve’s words. Nate visits Ferris Air (sometime workplace of Green Lantern Hal Jordan), but is turned down (even though they are impressed with his résumé). At Lockleed Aircraft, he comes across the same problem. 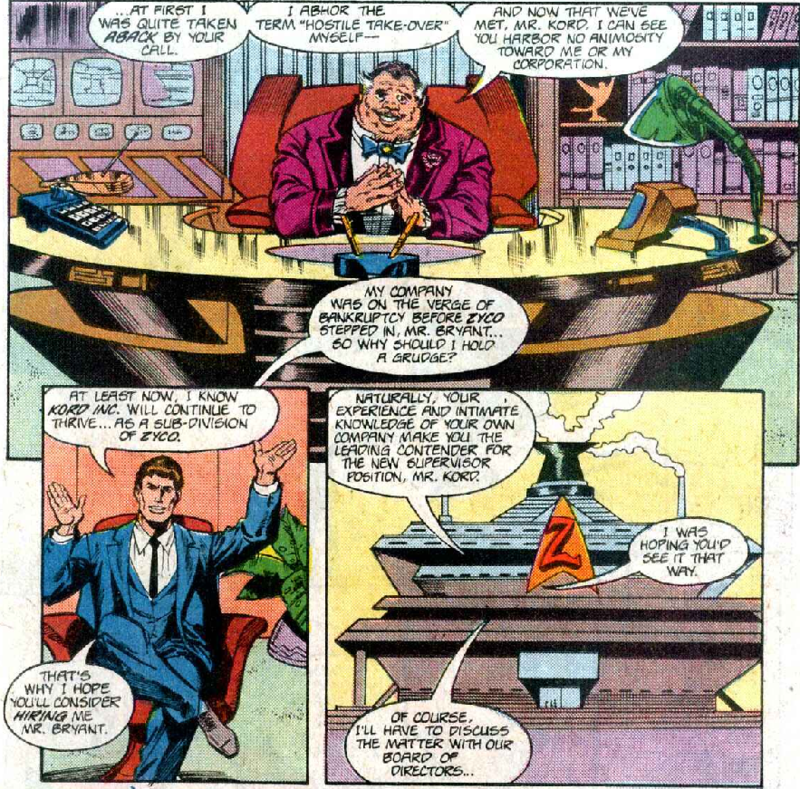 Martin Lockleed thinks to himself that he dare not hire Cameron Scott after a call he got from General Eiling. He’s allowing Scott to use the simulator even though he knows if Lockleed Aircraft hires the man, they’ll lose their government contracts. There is an explosion on the site which results in a power outage while Nate is in the simulator. Martin tells him to sit tight and stay out of their way. 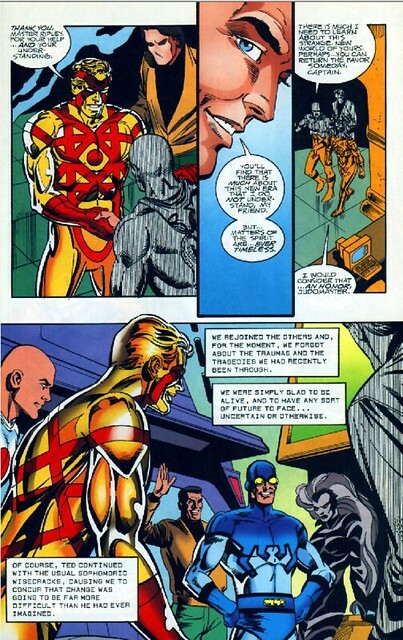 He’s concerned about some secret “stealthray.” Nate leaves the room and transforms into Captain Atom. He goes to Lockleed’s R&D department and finds passed-out technicians on the floor (having been tasered. or is it tased?). He absorbs the remaining electrical current from the taser darts and the techs come to. They tell Cap there were two assailants who were looking for the “stealthray” prototype. The two intruders (Teresa and Durang) are on the roof. 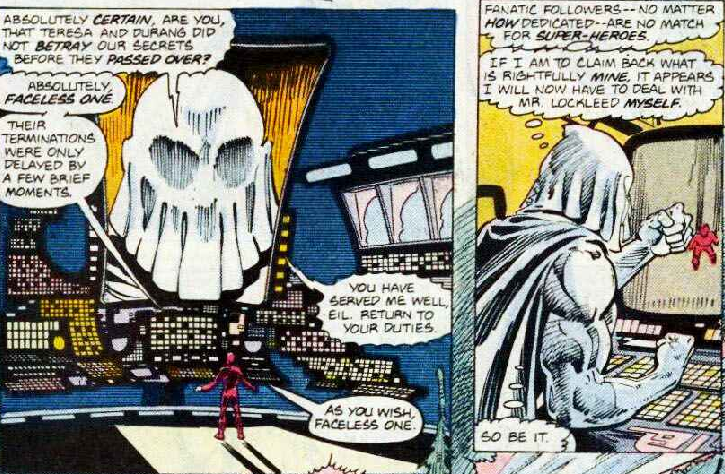 They are discussing their failure to obtain the stealthray for their master, “the Faceless One.” Die-hard Captain Atom fans will remember that the “Faceless One” from Steve Ditko’s Charlton Captain Atom era was also one Alec Rois, aka The Ghost. The two are discussing their options when they begin to be surrounded by a black fog. Out of the fog emerges Nightshade, who punches Durang. When Teresa takes a swing at Eve, she finds that Nightshade has become intangible. She then becomes tangible and knocks Teresa out cold like Durang. As the fog clears, Nightshade discovers Captain Atom has been watching her. 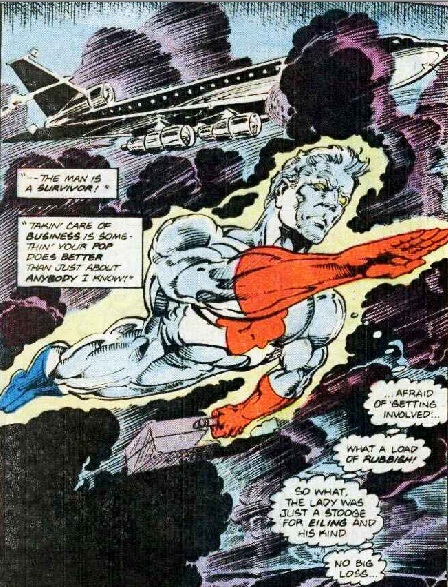 The Faceless One takes matters into his own hands and teleports to Lockleed Aircraft. He reveals in his inner monologue that he created the stealthray and he feels Lockleed stole it from him. 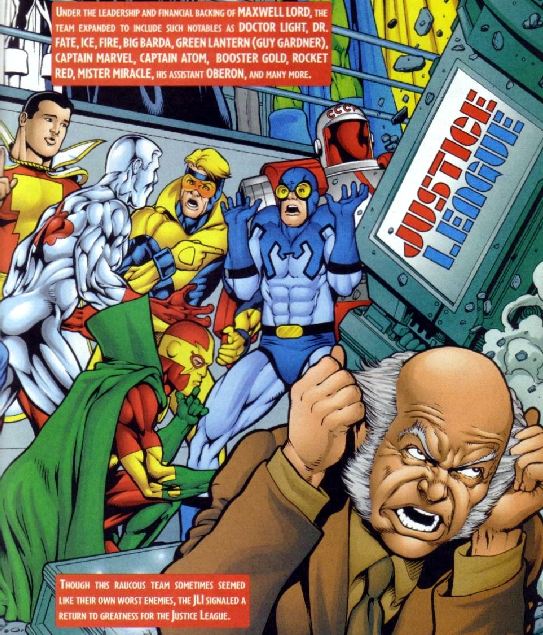 Nightshade and Captain Atom meet up in Hangar 7 at midnight, where Nate confesses that some of the things Nightshade said to him were true (she accused him of turning his back on his duties). Lockleed appears but is interrupted by a call from his secretary. General Eiling is on the phone again. Nate overhears this and is angered when he hears Lockleed’s assurances that Cameron Scott will not be hired. Nightshade convinces him to play it cool. 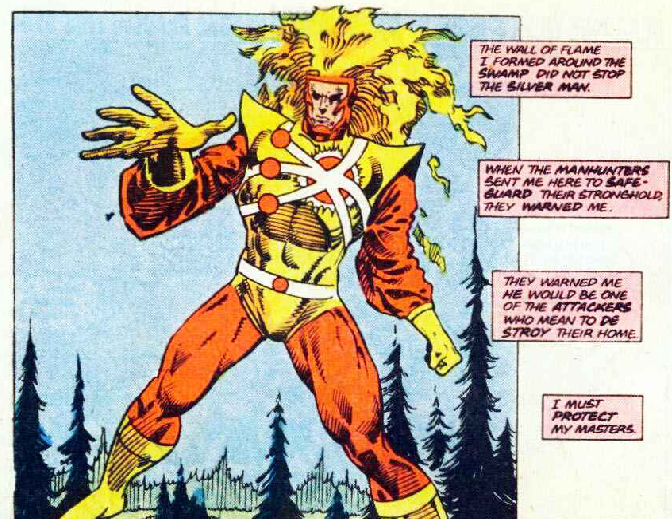 Lockleed tells the heroes that a former scientist working for him, Alec Rois, was perfecting a teleportation device called “stealthray” when he fell in with a weird fringe group/religious cult. Rois was let go by Lockleed, but believed the stealthray was his alone and not company property. 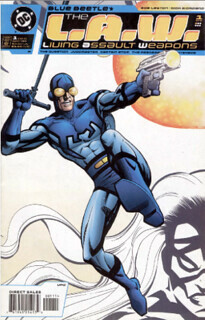 Just as Martin reveals that the stealthray is in his own pocket, the Faceless One appears and attacks (he is flying and shooting energy blasts out of his belt). 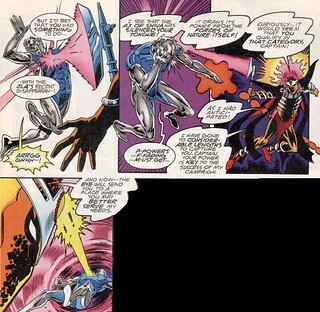 When Cap throws a quantum blast at the Faceless One, it is absorbed and thrown back (his cape reflects energy). Martin tries to reason with the villain (who is, of course, Alec Rois). Martin gives Rois the stealthray, but Rois isn’t satisfied and tries to impale his former boss on the spikey nosecone of a plane. Cap melts the spike and Nightshade distracts Rois with a burst of black light. 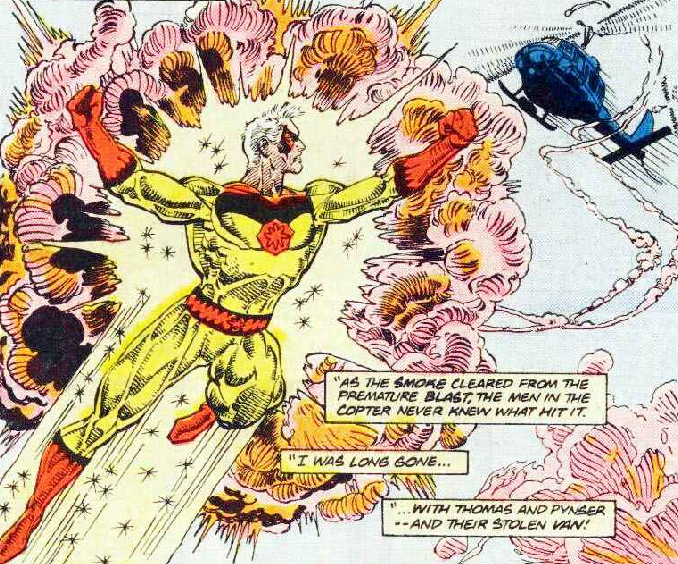 Captain Atom takes advantage of Rois’ momentary confusion and snatches Martin Lockleed to safety. Rois begins to teleport out. 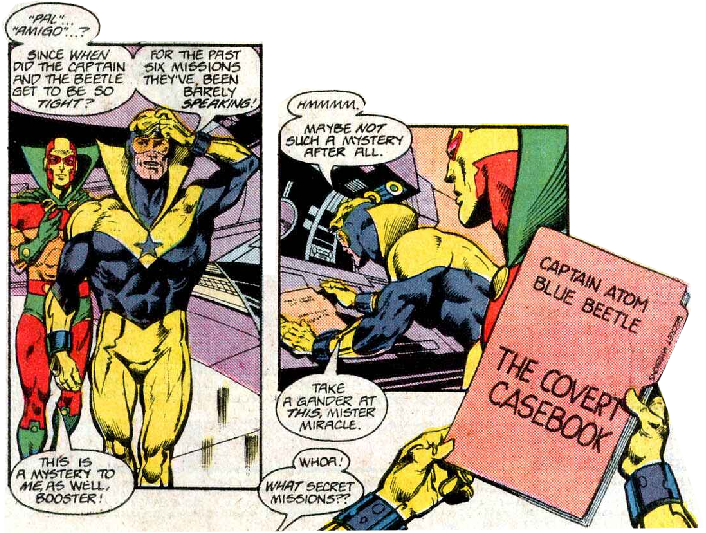 Nightshade warns Cap that Rois still has the prototype stealthray. Cap aims carefully and destroys it with a precise quantum blast. The next day, Martin Lockleed is telling “Cameron Scott” that he won’t be hiring him. Eve is waiting outside. Nate is still bitter, but not with Lockleed. He knows it is Eiling preventing him from getting a job. Eve has bad news of her own. Amanda Waller has called her in for a Suicide Squad mission. They part ways, unsure if their romance will continue. When I first read this in 1988, I was not entirely impressed. 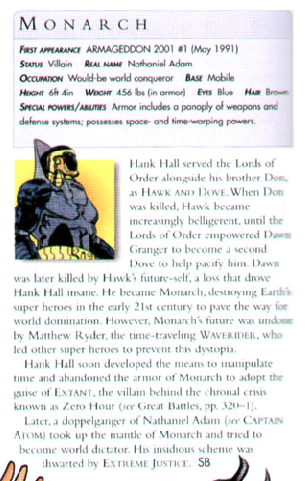 I didn’t know about Charlton Comics or Cap’s history at all. 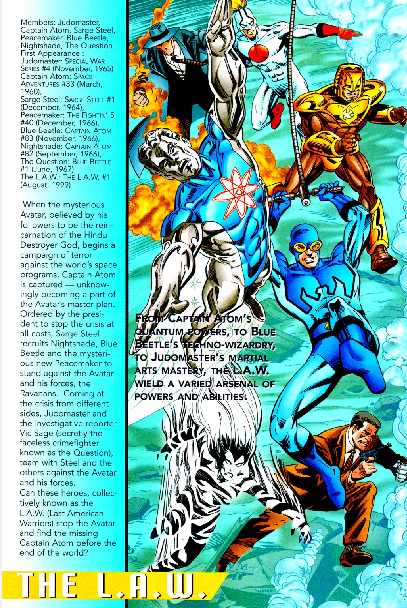 I didn’t understand why this particular character, Nightshade, was being teamed up with Captain Atom (I was unaware they were both created by Steve Ditko, as was the Ghost). And the Ghost seemed cool, but too easily defeated. Of course, now that I’m more familiar with Cap’s history, I love this issue. Nightshade is back (and still in her old costume). 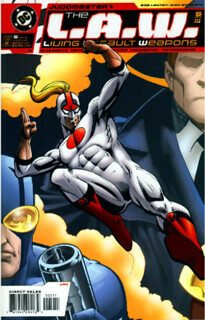 And Alec Rois never reached his full potential in the Charlton days. This issue, although not a lot happened in it, is one of my favorites of the series. 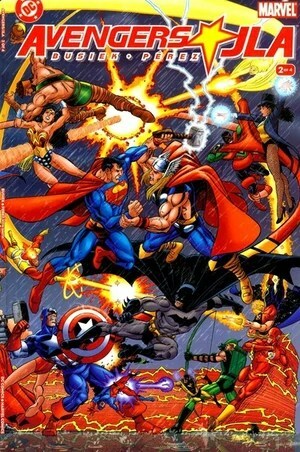 It further bridges the gap between the 60s Cap and the 80s Cap. One thing bugs me, though. Why did the Ghost give up trying to kill Lockleed? Sure, Cap melted the pointy end of the plane, but wouldn’t the hot molten metal do as much (if not more) damage if a person were shoved onto it? Still, Bates, Weisman, and Broderick all brought their “A” game. 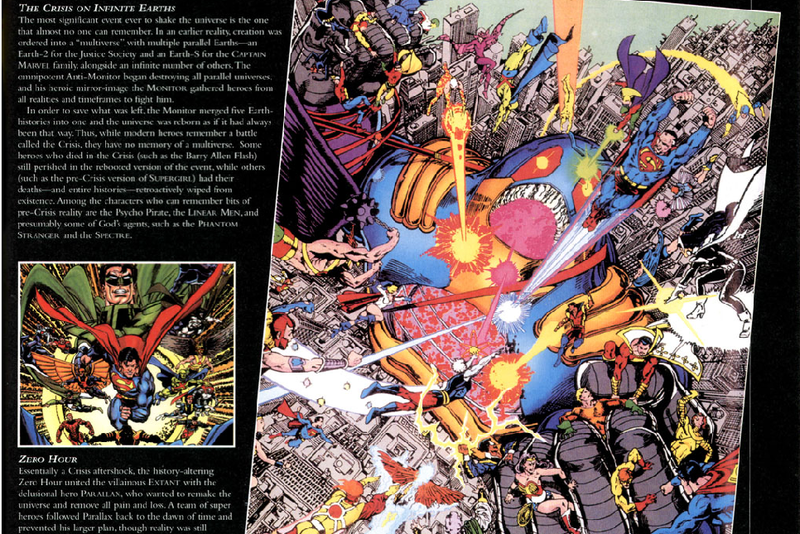 The series was written by Kurt Busiek with pencils and inks by the great George Pérez and colors by Tom Smith. They didn’t just throw the core members of each team at each other; many “fringe” members made appearances. 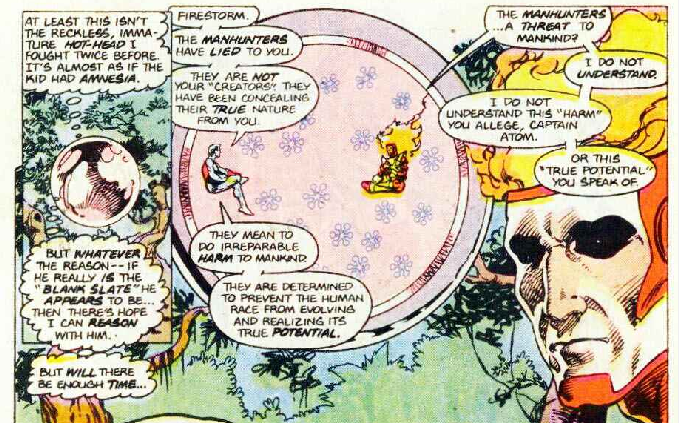 Captain Atom, Firestorm, and Red Tornado, for example. It was a fun mini-series that I’m sure delighted and angered fanboys (and fangirls) in equal measure. 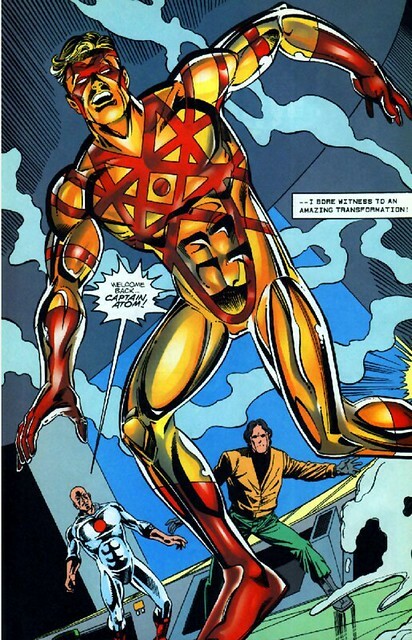 I thought it was great, but did have a “what the…?” moment in issue #2 when Captain Atom was taken down by Hawkeye. Now, I don’t have a problem with Iron Man besting Green Arrow. 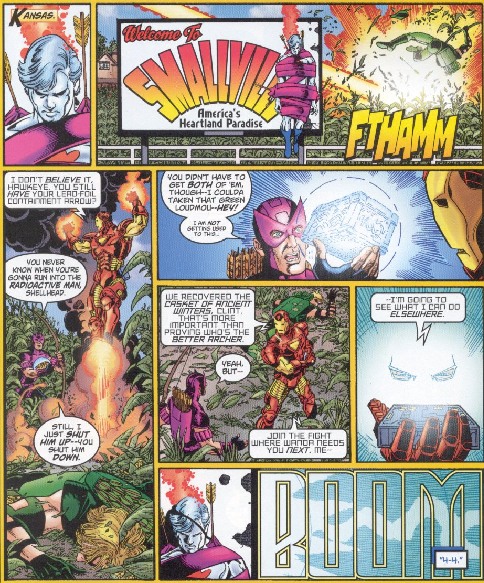 It would stand to reason that Tony Stark’s tech would outdo Oliver Queen’s. The obvious choice would have been to have Hawkeye face off with Green Arrow, but I like that Busiek didn’t always go with the obvious choice. But Hawkeye taking down Captain Atom? Really? Cap does recover, though. I mean, it was just Hawkeye. But then he is blasted by the Wasp and Yellowjacket. 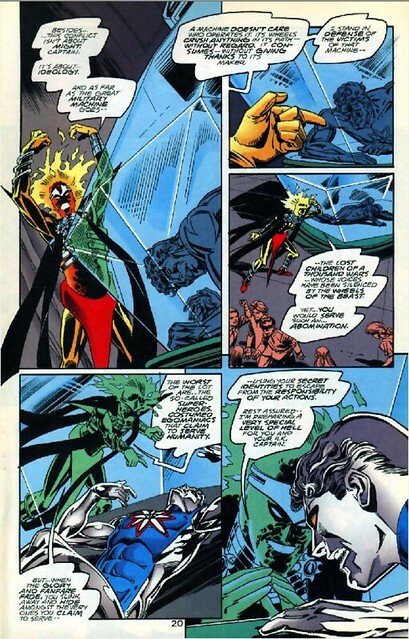 They do no lasting damage, as Cap and Firestorm are seen later on in the fight saving Green Lantern Kyle Rayner from Photon, who had absorbed the Green Lantern energy. She blasts them with this energy. The Wasp, by this time, has moved on to try and take down Plastic Man. 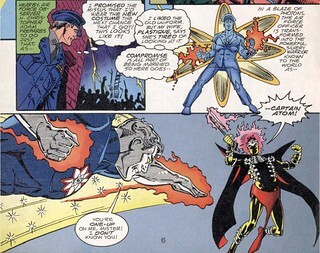 Firestorm and Captain Atom later combine their energies with Photon to try and take down Galactus. This attempt is most likely in vain, as Galactus is a god-like figure that feeds from draining living planets of all their energy. 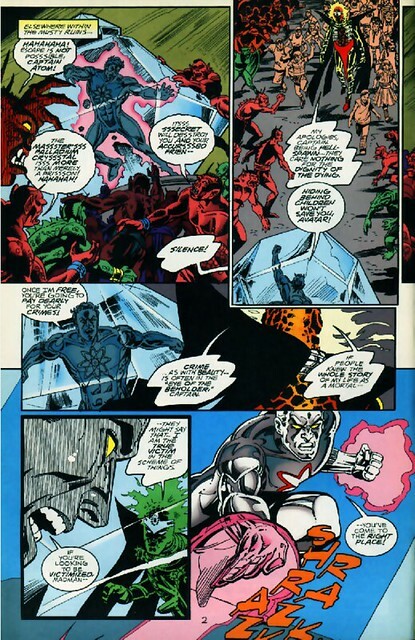 Captain Atom isn’t seen again until Avengers/JLA #4, where he and many other DC & Marvel heroes are fighting an army of super-villains. Presumably he made it out alive but he isn’t seen again in this final issue. This series was pretty awesome. The premise of these characters getting together is flimsy, but the execution is beautiful. 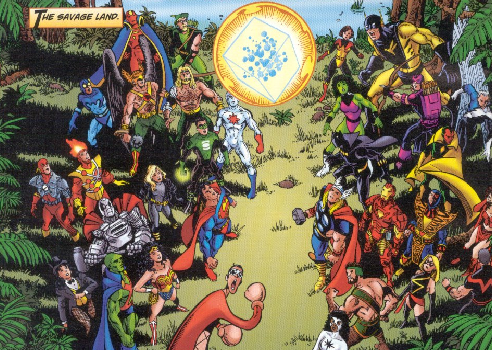 George Pérez is in his element, and he gives this series a Crisis on Infinite Earths feel. 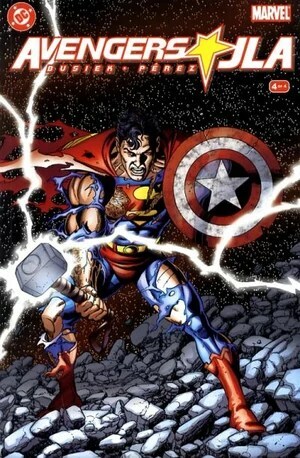 And Superman is totally badass wielding Thor’s hammer and Captain America’s shield. I give this whole series an A for story and an A+++ for art. Just look at that last panel. 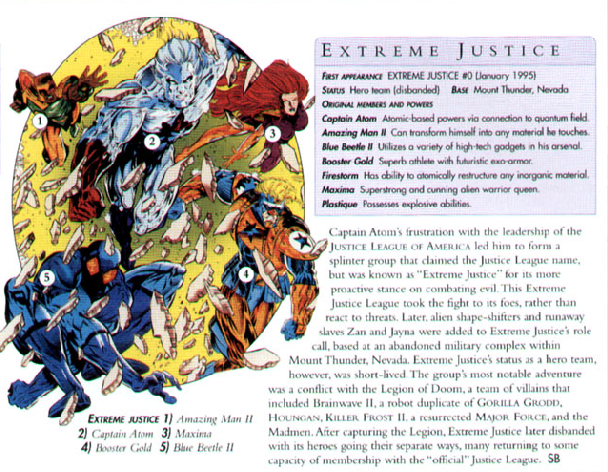 George Pérez is a genius talent. 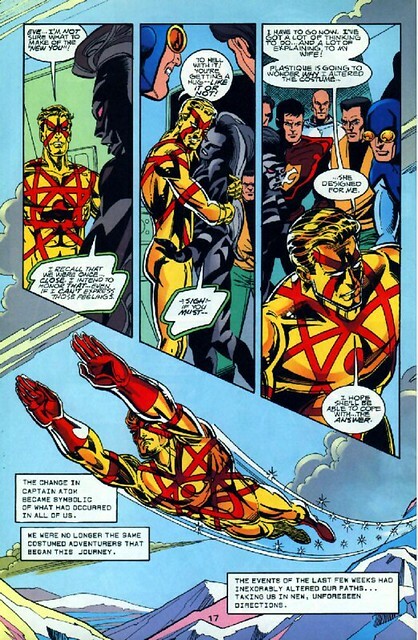 This page from JLA Secret Files & Origins #3 was penciled by Kevin Maguire and inked by Drew Geraci with colors by Tom McCraw. The picture depicts Shazam! 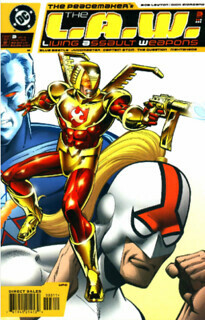 (aka Captain Marvel), Captain Atom, Booster Gold, Blue Beetle, Rocket Red #4, Mr. Miracle, and Oberon. 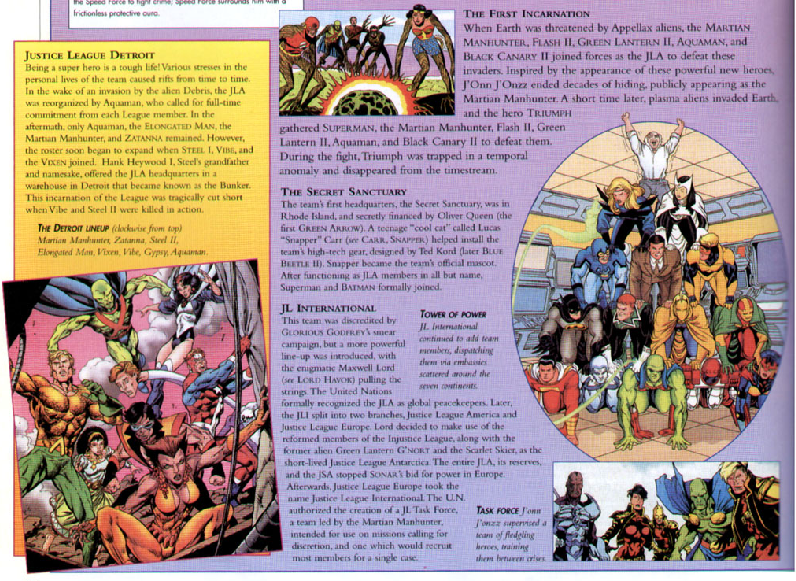 Not pictured above but part of the original two-page spread are Fire, Ice, Big Barda, Green Lantern Guy Gardner, Black Canary, Dr. Light, Batman, Max Lord, Martian Manhunter, and Dr. Fate.